We've all been there. It's some special occasion and us parents hand over a perfectly wrapped present to our little one only to have the child open it and start playing with an empty box in the corner instead! It may be tempting to throw away that empty box or empty coffee, yogurt, and/or cheese containers, too.. but DON'T! You just never know when you'll need them again, ya know?! I usually keep a stash for just this reason, my little one loves Tower Building with those old recyclables!! 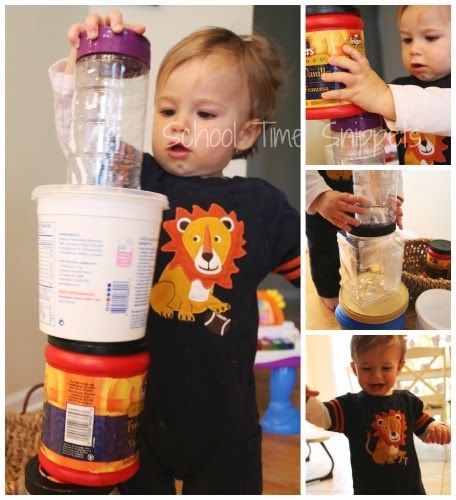 Bring out that stash of recycled containers and have your little one BUILD with them! I pulled out about five containers and Baby Boy (17mos) had a great time building towers and whipping his arm full force to knock it over! And bonus when activities can reinforce some type of skill like spacial recognition and coordination like this one did! So start saving those containers! Simple baby play ideas are the best! 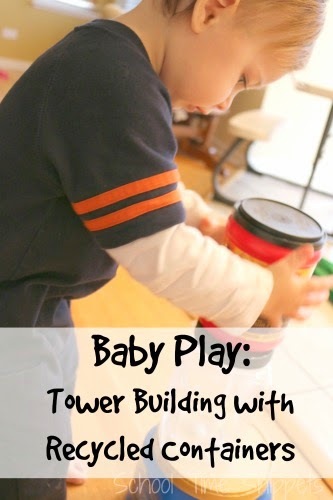 Another simple tower making idea for toddlers is to stack packaged paper towels ! 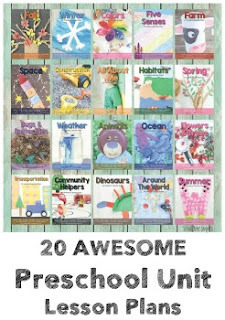 Fabric Scraps Treasure Bin, and more!